Scott Dixon clinched his 43rd IndyCar Series victory on Saturday evening at Texas Motor Speedway, moving up to the third place on the all-time winners’ list, behind AJ Foyt and Mario Andretti. The 37-year-old New Zealander in the #9 Chip Ganassi Honda has won the DXC Technology 600 race at 1.44-mile oval track after starting seventh on the grid and leading for 119 of 248 laps. It’s Dixon’s third win at Texas. The victory at Texas puts Dixon in the first place in the championship standings. 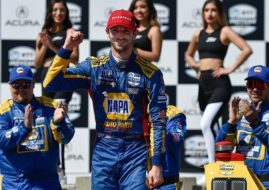 He collected 357 points in nine races, twenty-three more than Alexander Rossi (Andretti Autosport), who finished third at Texas, 4.567 seconds behind Dixon. Simon Pagenaud (Team Penske) finished in the second place, 0.27 seconds ahead of Rossi. James Hinchcliffe and Ryan Hunter-Reay completed the top 5. Defending series champion and pole sitter Josef Newgarden led the first 59 laps before making his first pit stop. He ended the race in the 13th place. Robert Wickens was next in the lead for 31 laps. He was later involved in a crash with Ed Carpenter. Will Power, winner of the Indianapolis 500 two weeks ago, finished 18th in the race and fell from first to third in the championship, 36 points behind Dixon. The IndyCar Series will return to action with the Kohler Grand Prix from June 22-24 at Road America in Elkhart Lake, Wisconsin.